An interview with Jennifer Kirk, 2000 World Junior Champion, US Medalist and World Team member, and a well-regarded skating journalist and commentator. 41 minutes, 20 seconds. On her most embarrassing skating moment: Now when I look back on it, it doesn’t seem that embarrassing at all, but I’m sure many skaters can relate. There were a few times when I would step on the ice with my skate guards on. There are few things more embarrassing — you just fly, and especially after the Zamboni has just resurfaced the ice, you get all wet before even starting to skate. And everybody’s standing by the gate and looking at you, that’s tough. And I remember one time at one of those pro-am events in Detroit, I was warming up and I did a triple lutz, and I pulled a Midori Ito, like she did at the 1991 world championships. I did my lutz and I jumped out of the rink [laughs]. On being a gymnast prior to being a skater: I think it helped me. I did gymnastics for many years, and when I started skating, I was also doing ballet many times a week. I think all three are similar in many ways. Gymnastics taught me to rotate really quickly in the air, and it taught me to control my body and to know what my muscles were doing. And ballet taught me really good discipline. It’s not all fun — the majority is doing the same routines over and over again at the barre. So it taught me how to focus and how to have control over my body. 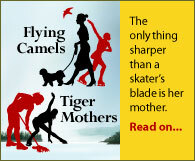 On how she began skating: My mom skated for fun when she was a kid, and when I told her I didn’t want to do gymnastics, she looked for another sport to set me up with. And I took some skating lessons and it just took off from there. I actually started around the whole time of the Nancy Kerrigan and Tonya Harding scandal, and that brought so much publicity to the sport and made me fall in love with the sport and want to be like Nancy. I performed with the Boston Ballet many times, in The Nutcracker and Midsummer Night’s Dream, but when I was 13 I decided that I wanted to train with Evy and Mary Scotvold on Cape Cod. And that meant I had to move away from my home and my family, and it made me have to make the decision of stopping ballet and devoting all my time to skating. It was tough, but the most difficult aspect of the decision was moving away from my family and going to a new school. On training with the Scotvolds: It was great. When I first started with them there weren’t many skaters there, but as I became more successful, more skaters from Boston came and trained with them, and I made some great friendships. Evy and Mary played such a great role in my career and I’m so grateful to them for everything they did. On winning the 2000 World Junior Championships: It was a perfect week. All my practices were really great. I had a really tough time (at US Nationals immediately beforehand), and I felt like the season had been so long and stressful that I didn’t really feel any pressure or stress. I was really able to just relax and enjoy the competition. And the other two US ladies [Sasha Cohen and Deanna Stellato] were favoured, so to win, it was really an exciting week. On her mother’s death in 2001, and burying the world junior medal with her: It was funny, because about six or seven months later, I went to the Four Continents championship, and I won the gold medal [in 2002], and the medal was the exact same as the world junior medal, only a little bit smaller. I felt really strongly that my mom should have that medal because she played such a large role in my skating career, so I felt that I should give something back for all the sacrifices she made. 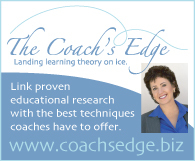 On changing coaches: I needed to define my style as a skater. I was a consistent competitor, I had solid jumps, but I wasn’t that exciting to watch [laughs]. I don’t think that Mary Scotvold really understood my style or where I wanted to go as a skater. But she and Evy were a package, and if I stayed with Evy I had to have Mary do my choreography. I probably was running away from the East Coast and all those memories, but it was tough going to all those rinks where I had skated and looking up in the stands and not seeing my mom there any more. I think I just needed a complete change of coaching atmosphere. On training with Richard Callaghan: It was definitely different than Evy and Mary. Mr. Callaghan likes to think of himself as a very technical coach, but my experience with him is that he doesn’t have the strongest technique, especially compared to someone like Evy. Mr. Callaghan’s strengths are in his ability to polish a skater, to push them through their run-throughs, to get skaters who maybe don’t have the focus or the drive within themselves — he can bring that out in them. I think in a way it was a mistake to go to him at that point in my career because he doesn’t have the strength of being a strong technical coach, but what he does have that helped my skating was a great team around him. At the end of my first year there, I got in a car accident, and I think that kind of scared everyone. So my sister moved there to live with me. It’s so easy when you’re skating to think that it’s all about you, and I look back at that time and I was pretty selfish [laughs], so it’s nice that we still have a good relationship and I can thank her now for all the things I didn’t thank her for then. On trying pairs with Fedor Andreev: It was something that just happened out of chance. Mr. Callaghan saw us practicing lifts off-ice, and said, why don’t you come out on the ice together and do some side by side jumps, and it just kind of took off from there. We were skating, like, six sessions a day between singles and pairs training. But it really helped our singles skating, and to have that partnership and that camaraderie between the two of us – we have a great friendship. It’s too bad that we were never able to compete together, but it’s good for a skater to do something new. You get so used to doing the same five or six jumps every single day, and doing your programs, so it was a great departure for both of us. I remember taking so many horrible falls when we were learning the throw double axel, but some of my best memories are as I’m on that back edge about to step forward, and I’m telling Fedor, no, I don’t want to jump, I don’t want to jump, and he’s giving me a pep talk, you’re going to be fine, although in pairs skating it’s the girls that take the biggest stumbles and have the biggest bruises at the end of the day [laughs]. But it’s nice to learn to trust somebody else in skating, and to have that friendship that we formed. If I was having a bad day, he was always able to talk me out of it. On changing coaches to train with Frank Carroll: I don’t think Mr. Callaghan was ever the right coach for me. I don’t want to say anything negative about him because he’s a great coach, but he became very controlling, and the more that I started to gain a little success in my career, he became more controlling. He wanted to know where I was on a Friday night, wanted to know what I was doing when I wasn’t at the rink, and I felt really suffocated. I didn’t think that he really had that technical ability to fix my jumps, and I wanted to find a coach that was going to be able to fix that. And I needed a change of scenery. I’m the type of skater who’s always going to work really hard and be in control, but it was almost too much focus on skating, too many people pushing to get me to do something which I was already being really hard on myself about. And at the time I was struggling with an eating disorder, and that’s all about control. And I think part of me felt that if I went somewhere else and had different people around me, maybe I would be a little bit happier and I would be able to get out of the depression and eating disorder I was struggling with at the time. On the dress for her Chicago program: A friend and I went to see the movie, and for some reason there was nobody else in the theatre. We were dancing in the back row of the theatre [laughs] and I just loved the sparkles on Roxie Hart’s costume, and I just knew that if I skated to that music and had a dress like that costume that it would be fun and it would be something I would really enjoy. [The dress] was all hand-beaded, and [Jef Billings, the designer] would FedEx it to the rink, because he was in LA and I was in Michigan, and then my sister and I would do fittings and take pictures and send it back to him. It was a cross-country dress. And there was always that fear that it wasn’t going to show up in time or that something else that would happen to it [laughs]. And the first time I put it on and ran through the short program, all my jumps were under-rotated, because the skirt was really heavy and it whipped — every time I jumped it would hit my thighs. And whatever he used on the skirt was really pointy, so I was getting marks all over my legs and on my thighs [laughs]. But when I went out to compete, the adrenaline kicked in and I didn’t really feel anything. On her hair at competitions: When we first met with Mr. Callaghan, he had this vision of what he wanted a female skater to look like. He wanted the shiny costumes, and every time we went to a competition, he wouldn’t settle for a ponytail or a bun — he wanted my hair really done up. So my sister and I, we would go through the hotel, or ask the concierge, or if we were in the US go through the phone book, and find a salon and book an appointment, hoping that all the hairspray and the bobby pins would stay in [laughs]. And there were some mistakes. I think I did one event where my hair was so poofy I looked like I was skating in the 1960s [laughs]. But I think it did add something to my style on the ice. On the reasons she retired from competitive skating in 2005: I had a hip injury which still bothers me today, and I couldn’t train the triple-triple [jumps] I could train before. [But] the eating disorder was the biggest problem in my life at that time. I needed to get control of it, and I needed to get help for it. When you’re struggling with an eating disorder, you don’t have a love or passion for anything. All the time I spent every day worrying about what I was going to eat, it really took over my life and any sort of joy I was getting from skating at that time. When I look back on it, when it became a problem which was probably about two or three years earlier, I wish I had received help right away. But I think I knew that the Olympics weren’t worth whatever I was doing to my body. And I don’t think at the time I was thinking about skating or about February [the 2006 Olympics], it was like, I have to get help because I don’t think I can live like this any more. Anybody who struggles with an addiction, which is what an eating disorder is, knows that you reach a point where you can’t live like this and you know you need help, and nothing else seems to matter. I wish the timing had been different and I wish I had been able to train and to try to make the Olympic team, but I’m proud of the decision I made and that I didn’t push myself to do something that wasn’t as important as getting healthy. On getting involved in broadcast journalism: [My dad is a journalist] and when we were kids, every time there were home movies, he would hand me a microphone and say, stand up and tell everyone what we’re doing today. So I was always in that mindset. And before I started skating I wanted to get involved in broadcast journalism. I’ve always enjoyed writing, always enjoyed being in front of a camera. So it just seemed the natural step to take after my skating career. On blogging: I started writing for True/Slant because they didn’t have anyone writing for them about skating at the time, and they were receptive to the idea. I’m not trying to be a journalist who calls up skaters and interviews them after every competition. I’m more trying to uncover things in the sport that the mainstream media doesn’t cover but that I know about from having been in the sport, things that even fans don’t know about, like overzealous skating parents [laughs]. I’m trying to come up with topics that people don’t hear about because they don’t get it from mainstream media. [Some of it] is hard to write, but it’s the truth. And if it’s not the truth, why not put it out there? There’s probably people that have parents that are intense as my mom [could be], and there’s people struggling with eating disorders, and I think by being honest, people appreciate that and can relate to that. On her claim to be “running from the Russian federation”: I went to the  Cup of Russia [competition], and the medalists and the people who skated in the exhibition, like Evan Lysacek, they received a glass egg. And after the competition, he and I were in my room, and we had the egg, and we were upset or something happened, and the egg smashed on the floor. And a few hours later, he and I were on the bus going to the airport, and someone got on saying, is Jennifer Kirk on the bus, so of course we had to get off. And they accused us of trashing a hotel room, which we didn’t do. The last night of a competition, skaters are partying a lot, there’s glass in the hotel room, the drawers are pulled out because you’re getting packed to go to the airport — it looks a certain way. But he and I had to write a letter to the Russian federation apologizing, and asking permission to get back into the country for the world championships a few months later. I don’t even know if I’m supposed to be talking about it, but it was a big scandal. We had to meet with the US Figure Skating Association and explain what happened. It looked one way, but I can promise you it wasn’t like that at all [laughs]. At the time it happened I didn’t have a printer, and I remember sitting at Kinko’s thinking what I was going to write in my letter and how I was going to apologize. “Dear Russian Federation, I’m sorry I broke your egg” [laughs]. On her skating now: The last time I skated was probably about a year ago. I had a friend who was training for some events, and she asked me to help her, so I got on the ice and skated a few sessions. It’s surprising how fast it comes back to you, because before that I hadn’t been on the ice for about three and a half years. I don’t really crave skating any more — I prefer talking and writing about it.